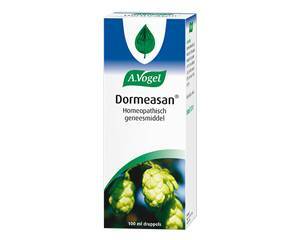 Dormeasan by A. Vogel is a homeopathic remedy used without therapeutic indications in accordance with the principles of homeopathic medicine. Dormeasan drops contain the following active ingredients: Avena sativa Ø 38%, Lupulus humulus Ø 9%, Lupulinum Ø=D1 1%, Melissa officinalis Ø 40%, Passiflora incarnata Ø 10% and Valeriana officinalis Ø=D1 2%. Alcohol content approx. 60% v/v. Unless otherwise advised, take 40 Dormeasan drops with some water 30 minutes before bedtime. If necessary, you can take an additional 20 drops right before you go to sleep. Wait a few seconds before you swallow. Children aged 2 to 6 years: 12 drops, 30 minutes before bedtime. Children aged 6 to 12 years: 20 drops, 30 minutes before bedtime.